An artist’s conception of this unusual system, courtesy of Jonathan Holden/Disk Detective. 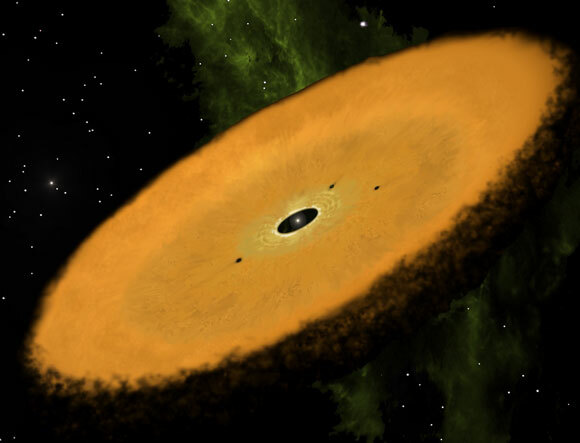 A group of citizen scientists and professional astronomers have discovered a star surrounded by the oldest known circumstellar disk — a primordial ring of gas and dust that orbits around a young star and from which planets can form as the material collides and aggregates. The discovery relied on citizen scientists from Disk Detective, a project led by NASA/GSFC’s Dr. Marc Kuchner that’s designed to find new circumstellar disks. At the project’s website, DiskDetective.org, users make classifications by viewing ten-second videos of data from NASA surveys, including the Wide-field Infrared Survey Explorer mission (WISE) and Two-Micron All Sky Survey (2MASS) projects. Since the launch of the website in January 2014, roughly 30,000 citizen scientists have participated in this process, performing roughly 2 million classifications of celestial objects. 1 Comment on "Astronomers Discover Potential New Hunting Ground for Exoplanets"